UN Secretary General Ban Ki-moon has called for an immediate end to fighting in the Gaza Strip during a meeting of the UN Security Council in New York. Mr Ban criticised both Israel for its bombardment of Gaza and Hamas for firing rockets into Israel. The UN also heard a French-Egyptian ceasefire proposal, backed by the US and Palestinian leader Mahmoud Abbas. Israel says it has agreed to set up a humanitarian corridor to allow aid into the Gaza Strip. Mr Ban said the Council had "primary responsibility for the maintenance of international peace and security" and urged its members to act "swiftly and decisively to put this crisis to an end". He said the longer-term issues of Palestinian divisions must also be seriously addressed and called for the "urgent continuation of negotiations for a political solution". "We need urgently to achieve Palestinian unity and the reunification of Gaza with the West Bank within the framework of the legitimate Palestinian Authority," he said. Palestinian health ministry officials say 595 people, including 195 children, have been killed since Israel began its offensive 11 days ago. An Israeli attack on Tuesday on a school building, which Israel says was sheltering militants, left at least 30 people dead and 55 injured, UN officials say. Mr Ban said he was "deeply dismayed" by the school attacks, branding them "totally unacceptable". 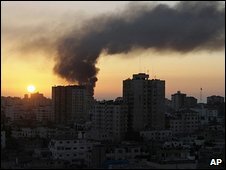 Israel, which has vowed to reduce rocket attacks from Gaza on its territory, has lost five soldiers and four civilians. In another development, Venezuela ordered the expulsion of Israel's ambassador in protest at the Gaza offensive and its "flagrant violations of international law". The ceasefire plan proposed jointly in New York by Egyptian President Hosni Mubarak and French President Nicolas Sarkozy would bring together all the main parties and take all measures to end the conflict in Gaza. The plan envisages the resumption of the delivery of aid to Gaza and talks with Israel on border security, a key issue for Israel as it says Hamas smuggles its rockets into Gaza via the Egyptian border. Welcoming the proposal, US Secretary of State Condoleezza Rice called for a "ceasefire that can endure and that can bring real security". The contours of a possible diplomatic agreement are in place, the BBC's Laura Trevelyan reports from the UN. However, if Israel continues to control the flow of humanitarian aid into Gaza and can choose to stop it at any time this seems unlikely to command the support of Hamas, she notes. Thus frenetic diplomacy in New York and in the Middle East is likely to continue. Israel's ambassador to the UN, Gabriela Shalev, did not say whether Israel would accept the proposal but said it would take it "very, very seriously". Meanwhile, Israel has proposed suspending attacks in specified parts of Gaza to allow people to stock up on essential goods. The military will open up "areas for limited periods of time, during which the population will be able to receive the aid", the office of Israeli Prime Minister Ehud Olmert has said. The office said the goal was to "prevent a humanitarian crisis". Andrew Whitley of the UN relief agency told the BBC that any relief in the conditions of the people of Gaza could only be a good thing. "It's a major humanitarian crisis," he said. "People have been weakened by 18 months of blockade and siege. They've been getting very little food, electricity or heat for a long time, and so they are in a very weakened condition." UN officials have said that the al-Fakhura school in the Jabaliya refugee camp was being used as a refuge for hundreds of people when it was hit by Israeli shell-fire. The Israeli military said its soldiers had come under mortar fire from Hamas militants inside the school. A spokesman for Hamas denied there had been any hostile fire coming from the school. In all, at least 70 Palestinians and five Israeli soldiers were killed on Tuesday. Israel says its offensive is stopping militants firing rockets but at least five hit southern Israel on Tuesday, injuring a baby. Casualty claims in Gaza cannot be independently verified. Israel is refusing to let international journalists into Gaza, despite a supreme court ruling to allow a limited number of reporters to enter the territory.